Representative Honours: Northern Ireland: 4 Full Caps (1983); Irish League: 5 Caps / 1 Goal (1980-1987). Club Honours: (with Ballymena) Ulster Cup Winner 1980/81, Co. Antrim Shield Winner 1979/80; (with Glentoran) Irish League Champion 1987/88; Irish Cup Winner 1982/83, 1984/85, 1985/86, 1986/87, 1987/88; Gold Cup Winner 1986/87; Ulster Cup Winner 1982/83, 1983/84; Co. Antrim Chalice 1987/88. Limavady-born Gerry Mullan rose through a number of local teams before making it into the Irish League with Ballymena United. With Ballymena he claimed a Co. Antrim Shield winner’s medal, scoring twice on the way to a penalty shoot-out Final win over Crusaders, and an Ulster Cup medal. He scored 28 goals in a little-over two seasons with the Braidmen before earning a move to Everton in October 1980. He failed to make an impact at Goodison Park, a change of manager in May 1981 not helping Mullan’s cause. 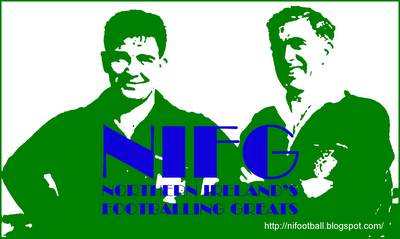 He returned the Irish League with Glentoran without making a firstteam appearance for Everton in November 1981. So convinced was Glens-boss Ronnie McFall that Mullan still had plenty to offer that an Irish League-record fee of £30,000 exchanged hands. Within days of his arrival at Glentoran Mullan was in the Northern Ireland squad. He was an unused substitute for the crunch World Cup qualifier against Israel on 18 November 1981 – Gerry Armstrong’s first-half strike was enough to take Northern Ireland to España ’82. Mullan’s hopes of making the squad for the Finals were dealt a blow as he took time to settle at the Oval, with club-mates Jim Cleary and Johnny Jameson preferred for Billy Bingham’s Finals twenty-two. 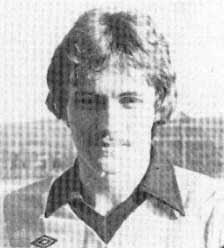 Mullan began to show his form-of-old in 1982/83. He scored seventeen goals in all competitions and claimed Ulster Cup and Irish Cup winner’s medals. In the Irish Cup he began a terrific sequence, for while Linfield had a stranglehold on the Gibson Cup, Glentoran won the Irish Cup five times in six seasons with Mullan scoring the opener in the 1983, 1985, 1986 and 1987 Finals. Billy Bingham was also watching Mullan’s form. 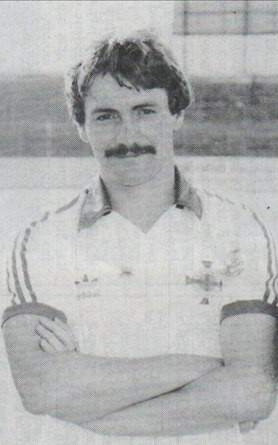 He finally made his Northern Ireland debut, as substitute for Noel Brotherston, in a 1-0 European Championship Qualifier win over Albania in May 1983. He then started each game in that season’s British Championship, though he never produced the goal threat expected at international level. Perhaps Mullan’s most remembered performance for Glentoran was against Paris Saint-Germain at the Parc des Princes in September 1983 when he scored to give the Glens a half-time lead and real hope that they could overcome a 2-1 deficit from the first leg. Alas it was not to be as PSG scored twice in the second half to claim a 4-2 aggregate win. 1987/88 brought Mullan his best ever season in front of goal. He struck the net 27 times, including four hattricks, as Glentoran finally broke Linfield’s run of six consecutive titles. Added to that was another Irish Cup success, though it was a disappointing day for Mullan personally as he was substituted without scoring his customary Final goal – only a last minute Jim Cleary penalty gave Glentoran a 1-0 win over Glenavon. He played his last game for Glentoran in the Co. Antrim Chalice Final against Ballymena, signing-off in style with a hattrick in a 4-2 win. In the summer of 1988 Mullan made a surprise transfer to Coleraine in an exchange deal that took Billy Totten to the Oval. He spent two seasons providing regular goals for the Bannsiders, but despite some spirited League campaigns, never looked likely to add to his medal haul. Summary: 3(1)/0. Won 1, Drew 2, Lost 1.